The Whirlwind is a heavy duty outdoor swing sign that is ideal for pavement advertising and retail promotions. It’s weather resistant with a base that holds approximately 25l of water, which helps greatly with windy conditions. The snap frame supports A1 sized posters which are included in the price and easy to replace for ongoing updated promotions. 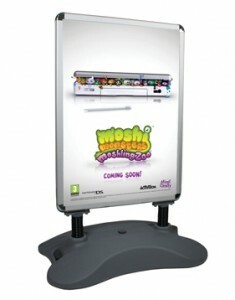 It has a spring pivot which supports the poster frame, which again helps in windy conditions. The Whirlwind is delivered flat packed. SKU: 664. Category: Banners / Outdoor Displays.